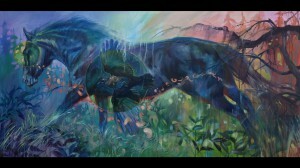 Join us Friday, May 10, 5-8pm in Legends Club for a grand opening of the Legends Club art gallery curated by onsite equestrian artist, Tammy Tappan, and featuring multiple guest artists from TIEC’s 2019 Artist in Residence Program. 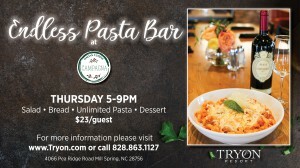 Enjoy wine and cheese snacks, live music and gorgeous artwork, and enjoy dinner at any of our onsite restaurants for the perfect Friday evening date night. 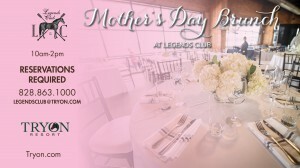 Mother’s Day Brunch Sunday May 12th, 10am – 2pm Price: $34.95/Adult & $15.95/Child Reservations Required: 828-863-1000 Join us for an incredible Mother’s Day on the back porch of Legends Club on Sunday May 12th, 10am – 2pm, and enjoy a delicious buffet of traditional breakfast and lunch favorites along with a cash bar. 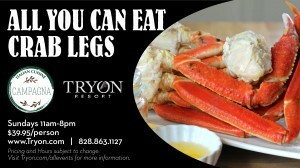 Make your reservations today! 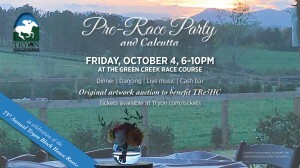 Join us Friday, October 4, at the Green Creek Race Course for the annual Pre-Race Party and Calcutta ahead of the 73rd Annual Tryon Block House Races! Live music, Dancing, Dinner and a Cash Bar PLUS an auction of original artwork benefiting TR&HC will make this a night you don’t want to miss! October 4, 6-10pm Band kicks off at 7pm Rain location: Legends Club at TIEC Click here to learn more about the date change.